There is no more denying it. We are full speed ahead into Fall! I haven’t worn shorts or a dress in weeks, the sweatshirts are zipped up when we head out in the morning and the windows are no longer being opened during the day. Though I do love Fall, I hated seeing Summer come to an end this year. So though I may not be able to put away the flip flops quite yet, I have no problems breaking out the Fall recipes! I love making soup at least once a week, baking with pumpkin and apples as my children go to the Farm, and I LOVE LOVE LOVE the Fall colors here in New England. So of course the Sunday Supper family was going to have a Fall event right!! 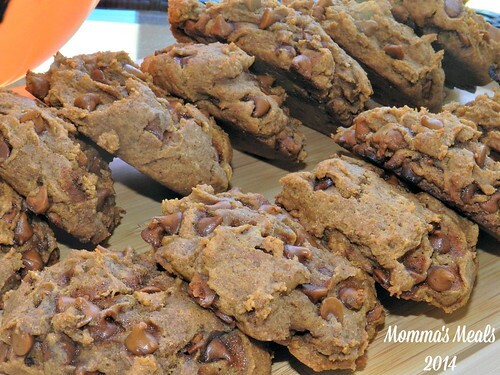 This week Coleen from the RedHead Baker is hosting and I’m bringing these Pumpkin Cinnamon Chip Cookies. She also has a fabulous Co-Host, Conni from The Foodie Army Wife. Thanks for hosting this event ladies and having us around your virtual table! Anyone that knows me is going to be blown away with what recipe I decided to make today. I’m a soup fanatic and I love baking anything in my oven for dinner in the Fall and Winters months. The fact that I brought a dessert is probably going to be quite surprising! However I’m sharing these cookies with you today because I make them every year and they are the only cookies I indulge on come this time of season. I actually want to try making them with fresh pumpkin puree instead of canned, I challenge anyone to give it a shot! They are super moist and they don’t have your average cookie texture to them so don’t be scared. This is exactly how I like my cookies! The last few years I used chocolate chips however this year I wanted to try something different. Another thing that made this year a little more special than usual while making these scrumptious cookies is that my almost 4 year old helped me. She hasn’t cooked/baked in the kitchen with me in quite sometime so when she said she wanted to help I pulled her stool up to the counter and I let her measure, pour and mix everything. Then she wouldn’t try the cookie. Probably because it didn’t come from a package. 3. Add vanilla and chocolate chips and mixed together. I had to capture the moment in the kitchen with my girl. There are fairs galore, carnivals, Fall festivals, lets see what other recipes have been brought to this Fall occasion! Your blog looks great! And so do these cookies. At first I thought they had cinnamon chips in them, which would also be yummy. I even picked up a pack of pumpkin spice chips the other day. Yum! Your pictures are making me drool, I want a stack of these cookies so bad!!! So yummy! I love recipes that become annual traditions and these cookies look drool-worthy!